Manufactured in Japon from 1957 until 0. Behind the shop window you admire its pure and original shape, compact and reassuring. A the German's touch, tough ... ... that's for sure. 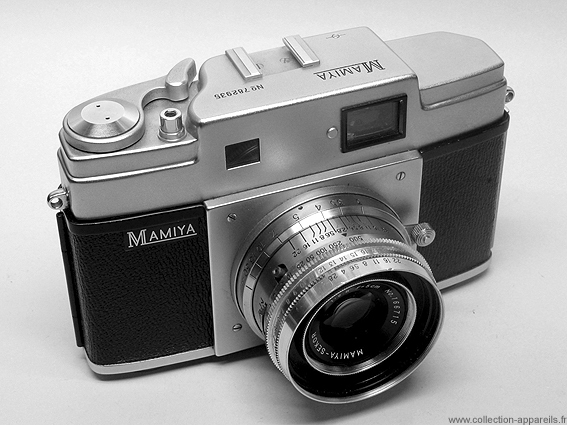 Beautiful plating, nothing protrude; not even a wheel ... certainly a serious and functional camera. You enter the store. The seller coke and triggers greedily, repeatedly, the shutter with its muffled music, but open and clear. The device seems larger than in the window ... unless ... not! The seller hands are "normal." The seller opens its back, it is clean and serious; no complaints. 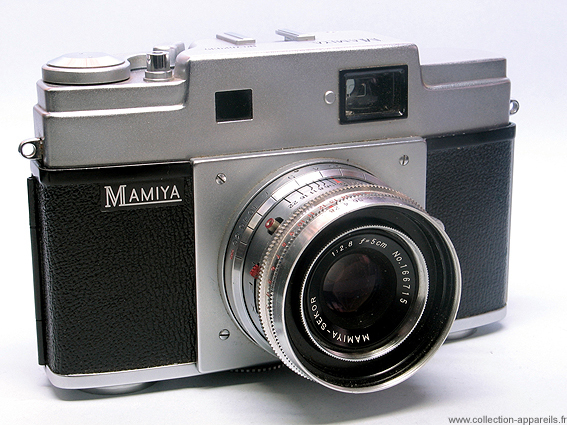 This is really, as marked on the label, a 35 mm 24 x 36, rangefinder camera and "changeable" lens. - Lens (inter) changeable, screw mount - MAMIYA SEKOR 1 : 2,8-22 / 5 cm. focusing ring with lever. Only a 1: 2.0 was available in other compatible optics. - Shutter: SEIKOSHA-MXL. 1 second to 1 / 500th + B, flash sync M + X. By the way, why "MAGAZINE"? Immediately you feel a disorder. Something's not right ... but what? That is it! Your amateur expertise was almost immediate. This device is a little too heavy for its size. From the corner of my eye, you catch the amusement of the seller: "One more ". You had found the "what" but still not the "how". In fact this device is named MAGAZINE because a rare feature for a small format. It has an original interchangeable back. Yes, but a back that integrates all the film winding and rewinding system. The trick of the suitcase with a double bottom! On the bottom face, a large lockable selector switch allows you to install or remove the back. In normal position, the removable back is completely forgotten, except by its weight. To remove the back, put the switch to the UNLOCK position (LOCK normal position). A metal flap closes the film chamber and disengages the case back. On the sole of the back, there is a reminder of the sensitivity of the loaded film and a mechanical views counter. To rewind the film you must remove the back and use the hidden knob located between the top of the back and the body cover. In 1957, it was the first 35mm camera subject to"normal" commercial distribution to have this characteristic. Before it, there was the legendary Kodak Ektra, who proposed this option in 1939 ... for a year; and the ADOX 300 in 1956, whose life was even more ephemeral. Praised by the US specialized press as "intelligent camera" or "device that combines excellence in optics and mechanics," It should have had a flourishing career. But at a price of $ 90 in 1957 (and $ 42 for the only back), the marketing of this superb device did remain very limited. It is a character device, which I love; very original and interesting technically. And its quality is really impeccable. . I will have to repeat the experience soon.